As the mercury creeps up, our CSA box and farmer’s market finds are starting to expand beyond greenery into heartier and more adventurous veg. Enter, hakurei turnips. While asparagus and I are well acquainted, these little white turnips were new to my table. Originally I had thought about just shaving them raw but had been craving a hearty panzanella lately so I detoured from my plan. 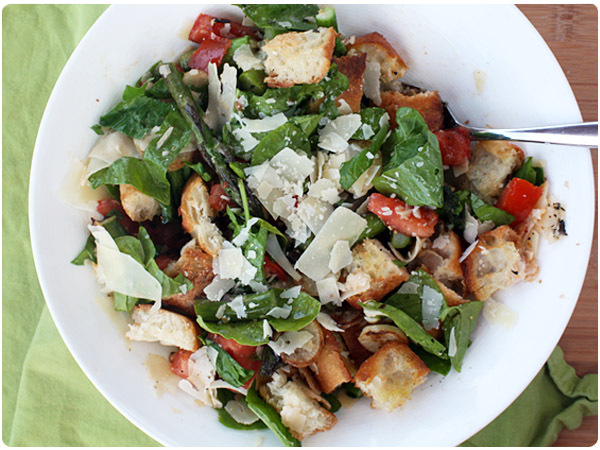 Panzanella makes for a fun, experimental salad (like most salads) where you can toss in whatever you’ve got handy. For this one, I ended up grilling everything but the spinach. The grilled hakurei turnips add an earthy-sweet element to the flavor mix. Since this was dinner, I served the panzanella alongside my Bacon and Grilled Scape Risotto, also replete with grilled CSA treasure. Trim asparagus ends and set aside. Trim off turnip greens and ends, then slice turnips into disks. Slice tomatoes and set aside. I used a grill pan to do my grilling but you could certainly use a real grill. I would, however, recommend a grill basket for the smaller vegetables. Using a grill pan, add about 1 Tbsp olive oil to the pan and shift pan around to coat lightly. Add asparagus and turnips. Grill on medium heat for about 4 minutes or until grill marks begin to appear, then flip vegetables and repeat. Once both sides are nicely marked, remove and set aside on a cutting board. Transfer baguette halves onto grill pan and grill for about 5 minutes, until bread developed a golden crust or grill marks. Set aside. Transfer tomatoes to grill pan and grill for about 2-3 minutes per side. Roughly chop asparagus and tomato into large bite sized pieces. Slice baguette into large, crouton-like chunks. Add vegetables and bread to a large bowl. 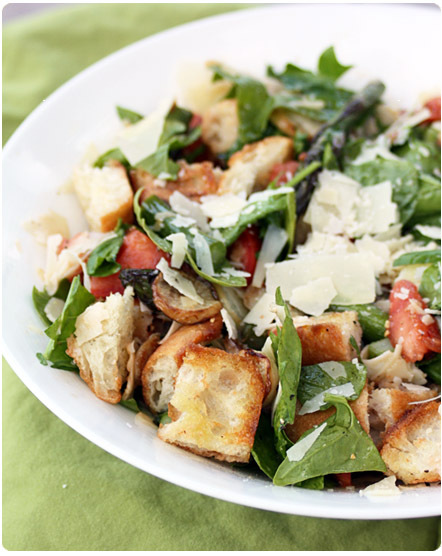 Toss with spinach and shaved parmesan. Drizzle lightly with red wine vinegar, cracked black pepper and salt. Toss to combine. If desired, toss with an additional drizzle of olive oil. Serve warm.